Get Vendio Gallery - Now FREE! 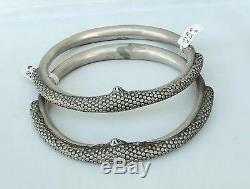 Vintage antique ethnic tribal old silver anklet Bracelet or upper arm Bangle Bracelet pair from Rajasthan India. Beautiful stamped Gajare design solid pair in very Good wearble condition. Inner diameter-10.2 cm (4.01"), Total inner circumference-32 cm (12.59"), Total weight of pair-475 Grams (16.69 ounces) Width-1.3 cm (0.51) Material-Solid sterling silver Note-we can sell single also for half of the price. We treat any problem with goods or service very seriously and you WILL receive IMMEDIATE attention. Wholesalers and dealers are welcome. We are manufacture of all kind of silver, gold & stones jewellery. Check out my other items! Be sure to add me to your favorites list! The item "Vintage antique ethnic tribal old silver anklet upper arm bracelet bangle pair" is in sale since Wednesday, May 23, 2012. This item is in the category "Jewelry & Watches\Ethnic, Regional & Tribal\Other Ethnic, Regional Jewelry". The seller is "tribaloldsilver" and is located in tribaloldsilver. This item can be shipped worldwide.